Martina Römmelt-Fella is Managing Director of the Bavarian company FELLA Maschinenbau GmbH and founder of KMU gegen TTIP (SMEs against TTIP). The SMEs against TTIP initiative was started in September by five entrepreneurs from differing parts of Germany. They are calling for the immediate cessation of TTIP negotiations. Why? The planned agreement covers far too much. All sectors of the economy, public services, culture, agriculture and so on. We believe that they need to go back to the drawing board, reboot and everything that TTIP is going to regulate needs to be clearly defined. We’ve come up with a checklist of things that should be guaranteed, including transparency, standards and democratic processes. 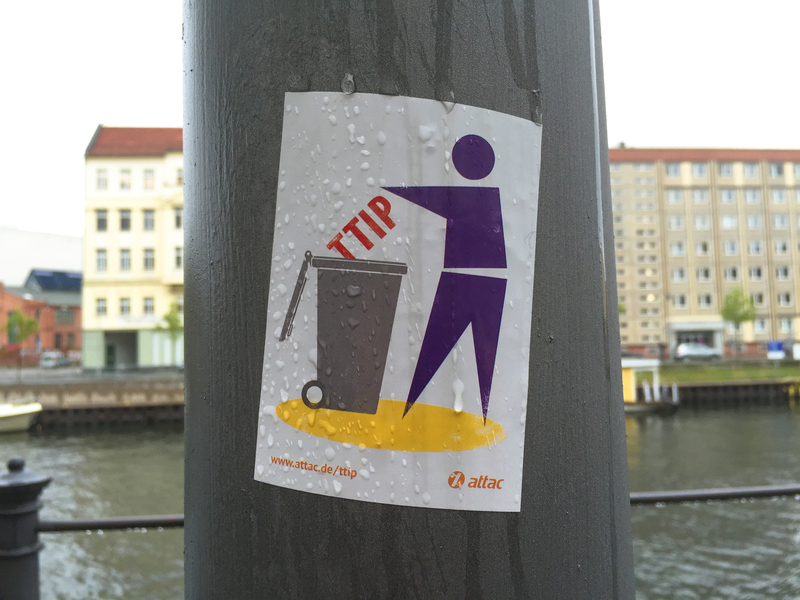 The initiative is intended to give businesses a platform to voice their concerns about TTIP. Is this actually happening? The response has been enormous, especially given that businesses are not often the ones who criticise this type of agreement. The media have reported on the initiative, ranging from Berlin to Frankfurt. It is of particular importance to us that the Chamber of Commerce and other associations take the critics in their own ranks more seriously and invite our representatives to events and debates. This has not been the case so far. The Association of German Chambers of Commerce and Industry’s (DIHK) representative, Volker Treier, said that the European Commission and the German government are not interested in your initiative’s concerns. Is that right? Treier is all for a fair, transparent TTIP agreement, in line with European standards. That’s great to hear. But the proposed alternative to the Investor State Dispute Settlement (ISDS), the arbitration tribunals, shows that there are still gaps to be bridged. The DIHK base their position on surveys carried out on companies that are already strong on the export market. Companies that have a regional outlook are not taken into account. When Herr Treier maintains that “European consumer, environmental and social standards will remain,” that’s nothing more than a pious hope. We don’t have much faith in it. The EU delegation has already caved in, weakening the standards associated with the carcinogenic Captan pesticide. European consumers’ demand that mandatory labelling be used for food produced using genetically modified materials, for example, milk-cows fed with GM feed, was shelved long ago. The lifting of a ban on lactic acid treatment of beef carcasses is another prime example of a reduction in standards. Herr Treier asserts that “public services will be safeguarded”, a claim that is scarcely credible given the negotiating mandate’s drive for “ambitious liberalisation”. Municipal procurement demands, like tariff rates and sustainability criteria, local development and use of local products in school canteens, are ignored by TTIP and CETA. The existing privilege of SMEs would be undermined, especially by the powerful “Buy American” movement. In the future, necessary or desirable public services that have not been included in the agreement will only be considered through the negative list and will, therefore, be excluded from liberalisation. There are a lot of imprecise and complex regulations surrounding these services, with a number of exceptions and extenuating circumstances. Legal representatives expect the regulations to be vulnerable and damage claims will be in the offing. Since the beginning of September, over 1,700 entrepreneurs have signed up to the initiative. In Germany, there are more than one million SMEs. Does this mean that the majority are pro-TTIP? For the majority of the 2.2 million SMEs in Germany, TTIP is still a long way off. Many business owners, especially the smaller enterprises, may feel that the issue does not concern them, or they may not have time to engage with the initiative due to the demands of running a business. One of the main reasons for this is that the negotiations lack transparency. What will TTIP’s impact on small pharmaceutical companies be? On the mechanical engineering sector? What can farmers expect? We want to protect these sectors, before it’s too late and the EU institutions agree to a deal that will be unchangeable. France has already openly threatened to pull out of the TTIP negotiations. Sigmar Gabriel (German Minister for Economic Affairs and Energy) has always said that a breakdown in the negotiations would achieve nothing and is not up for debate. How do you explain this attitude? The attitude of the French Secretary of State, Matthias Fekl, shows a sense of responsibility that is lacking from our own economic minister. Instead of engaging in a direct dialogue with TTIP’s critics, he prefers to put pro-TTIP propaganda in newspapers. It is not “German angst” that causes us to question TTIP. We have legitimate arguments, many unanswered questions and can cite examples of serious risks from the existing NAFTA free trade agreement. Incidentally, it is beyond doubt that companies have a great influence on economic associations and directly on Gabriel himself. The large companies want to benefit from TTIP, even if it is at the expense of SMEs, which are often based regionally and provide niche products to a specific market. Matthias Fekl has acknowledged the concern that the US wants to conquer those markets for its own companies, without opening up its markets for European concerns. The Commission is now planning the introduction of a modern Investment Court System (ICS). Therefore, the controversial Investor State Dispute Settlement (ISDS) option is finally off the table. Do you see progress in the negotiations then? What the Commission is planning, or rather, what the Americans will accept or take off the table, is still unclear. In addition, critics have already pointed out that American companies want arbitration courts, as enshrined in the CETA deal, kept in the agreement. Cecilia Malmström, the EU’s Trade Commissioner, has merely renamed ISDS as ICS, the core mechanism remains the same. As before, the ‘new’ system undermines national legal systems and preserves the shortcomings of the previous model. This legal system is geared towards the interests of the big companies. This process is already being used to dispute, among others, anti-tobacco laws, bans on toxic substances, environmental-impact assessment guidelines, hazardous waste disposal and fiscal policy. The average cost of an arbitration process is €8 million, a price that few SMEs can muster. This two-tier system, where foreign investors are prioritised, is detrimental to our smaller businesses. What’s the next step for the initiative? We are beginning to examine the possible consequences of TTIP on individual sectors, such as engineering, agriculture etc. We hope to interest even more entrepreneurs in the initiative. We’ve set ourselves the target of getting 5,000 new signatories in the coming year. Additionally, we are going to remain in dialogue with business associations. We also intend to continue increasing our presence at TTIP and SME events, as well as organising our own functions in order to increase people’s awareness of small and medium enterprises. In an interview conducted by euractiv.de and translated by euractiv.com (25 November) Martina Römmelt-Fella makes a number of false claims about the on-going EU-US trade negotiations, known as TTIP. The negotiations aim to remove trade taxes and simplify rules for EU exporters. They will not change the way the EU regulates food safety, as clarified a number of times by Commissioner Malmström and other EU leaders. In Europe, the European Food Safety Authority (EFSA), an independent body, considers the scientific evidence and makes recommendations for lawmakers. Only after this scientific examination the European Commission and EU governments take decisions on different aspects of food safety. No EU trade agreement can change that and TTIP will be no different. In fact, these guarantees are also spelled out in the unanimous mandate for TTIP from all EU governments and in the resolution of the European Parliament. And once the negotiations are finalised EU leaders and Members of European Parliament would have to ratify the trade agreement, which provides strong democratic guarantees for its quality. By repeating these well-worn and unfounded critiques about food standards, Ms Römmelt-Fella perpetuates myths. More importantly, she misses an opportunity to mention the many benefits that TTIP could bring to the smaller firms who form the backbone of the European economy. Small and medium-sized enterprises (SMEs) account for almost 30% of the total value of EU exports to the US. In Germany alone, there are almost 21 thousand SMEs exporting around €12bn worth of goods and services to the US, the same amount as the German federal health budget. Yet these firms still face significant hurdles in accessing the American market. For example, BHS Tabletop AG, a porcelain company from Selb in Northern Bavaria, whose products still face tariffs of up to 25% when entering the USA, making them uncompetitive. Or Derdack, a software company from Potsdam who want to access the huge American market for government contracts but can’t because of US regulations. We see these problems all over Europe. For example, MEDITHAU SAS, a French producer of oysters and mussels have to get their products checked twice – in the EU and the US – for purely bureaucratic reasons. Or Mette Munk, a producer of authentic Danish pastries whose products are subject to an import tax of 6%, which translates to a price increase of more than 10% for American consumers. The list could go on. Many of the things the EU wants to achieve in TTIP would bring direct and immediate benefits for smaller firms in Europe. We want to remove tariffs and we want smaller EU firms to be able to compete for the same government contracts as US SMEs. We also want to simplifying regulatory procedures, cut the cost of doing business, and make customs information more transparent. In TTIP we also plan to have a specific chapter for SMEs, the first of its kind. That’s because SMEs face different challenges when they move into new markets than their larger counterparts. Trade barriers are proportionately more significant and even understanding the rules can be a challenge. But for that same reason, SMEs also stand to gain more – relatively speaking – than the big multinationals. An ambitious TTIP that makes transatlantic trade a simple and straightforward project is just the boost that SMEs need to expand. That will benefit people they employ in local communities across our continent. That is why the European Commission is committed to getting the best deal for them. FACT- Free Trade enriches huge companies, not nations, at everyone else’s expense. No jay totally wrong ! Mexico wouldn’t sell anymore fruits and vegetables to the united states if they have to pay toll causing just unemployment ! You could just end the Nafta on your American union and see the results afterward ! It’s always so simple to say Fact when there is no fact but proof in which the Nafta works well ! Not necessarily so, as Martina Römmelt-Fella the Managing Director of FELLA Maschinenbau GmbH is reported here to say, the only beneficiaries are going to be the USA. The effects will be the opening of the flood-gates for USA Steel which was embargoed several decades ago as well as other commodities which are presented under different legislative packages. Having USA lawyers round your backs every time you write something down is not for us in the EU. We do not need this bullying here. The European Union [and its forebears the European Community and before) was set up to assist the European Nations compete against countries such as the USA and it has succeeded. If it had not succeeded (the EU has over 500 Million Nationals compared to the USA at 310 Million) the USa would not want such free and unfettered access to the trade arrangements. We already have to pay through the ears and eyes for trading in the International World Markets for Oil, Shipping, Freight, and other essential commodities by using USA $ accounts and even though these may be barely 4% at maximum this is an imposition. Remove the USA $ from the trade system and then see what would happen. Add this to the TTIP and then watch the USA squirm.